We might still have April's lackluster releases to get through, but there's a real sense of momentum, a building anticipation, as the week's releases get just a little bit better each week. Most notably, we have Forbidden Kingdom, which gives us the first-ever pairing of two of the legends of Hong Kong cinema, Jet Li and Jackie Chan. This is something akin to Pacino and DeNiro finally appearing together in Heat, with the similar parallel of it happening about ten years too late. Li and Chan play rival lung fu masters in ancient China who band together to free something called The Monkey King, after they are joined by a time-traveling American with a secret weapon. I'm sure this all made sense at the time. 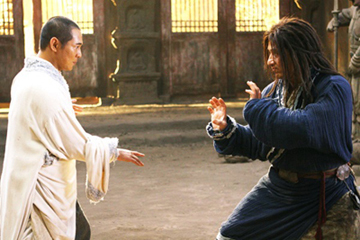 Of course, the plots of these films are typically ancillary to the fight sequences, which are courtesy legendary choreographer Wo Ping, albeit with some heavy CGI influence. Chan is well past his prime but still has some moves, and Li has basically announced that he's bored with fighting in films, so one wonders if the choreography is enough to make this film. It at least looks like it doesn't take itself too seriously, so that's something. Notably, it's a Western produced Asian film. These have generally never gotten the action quite right, but have puzzlingly, bafflingly been more successful. Forbidden Kingdom certainly won't be a Rush Hour, but then maybe that's a good thing at this point. It's a pretty strong bet to win the weekend box office, with about $17 million likely for an opening weekend total.